Smile Savvy seeks to be your internet marketing partner and expert, enabling your practice to grow. We use innovative and effective marketing strategies, while providing the highest level of customer care. Our people make it all possible. Smile Savvy, Inc. – a sister company of Dentists4kids.com – is the world’s largest internet marketing company for pediatric dentists. Although Smile Savvy launched in January of 2013, we have deep roots in pediatric dentistry business management through Dentists4kids.com. In 2000, the President, CEO and Co-Founder of Dentists4kids.com, Julie Fields, had been working for over 20 years as a business manager for a group of pediatric dentists. With the rising popularity of dotcom businesses, Julie, and the pediatric dental partners with which she worked, brainstormed their idea for an online directory that could help parents connect with pediatric dentists in their neighborhood. The team then began creating their “dream directory” and educational website. With Julie’s past experience in computer science engineering and practice management, coupled with her pediatric dental bosses’ knowledge of the industry, Dentists4kids.com was born. The popularity of the Dentists4kids.com directory grew alarmingly fast, as did the requests from dentists around the nation seeking help with their online presence. Before long, Julie had to retire from her business management position to run their new company full time. Since 2000, our team has served over 1,500 pediatric dental practices in 48 states and 6 countries. Smile Savvy provides dentists with comprehensive solutions for both online and offline marketing in a constantly evolving landscape. Our expertise in website design/development, social media marketing, local and organic search engine optimization and review building and reputation management has successfully connected pediatric dentists with patients for over 18 years. Smile Savvy has grown into the leading internet marketing company for pediatric dentists, serving over 40% of pediatric dentists nationwide. Attentive – Same-day service. We listen and care. Accommodating – Patient, helpful guidance. Authoritative – Making complex ideas simple. Authentic – Honest, only selling what is needed. Awesome – Service that exceeds expectations. Smile Savvy seeks to be your internet marketing partner and expert, enabling your practice to grow using innovative and effective marketing strategies, while providing the highest level of customer care. To make our vision a reality, Smile Savvy promises to exemplify unparalleled integrity, trust, respect, and excellence, which will enable us to become your internet marketing company of choice. Why was Smile Savvy Started? It became too difficult to cater to both parents and dentists under one website and social media account. For this reason, Smile Savvy was launched in January of 2013 to completely focus on the extensive online marketing needs of dentists, while Dentists4kids.com could focus exclusively on promoting its pediatric dental directory and oral health educational tools for parents. Dentists4kids.com and Smile Savvy look forward to many more years of serving dentists, parents, and kids online. We're working to make a difference. Every website we sell provides clean and safe water to a family of four for 3 years. 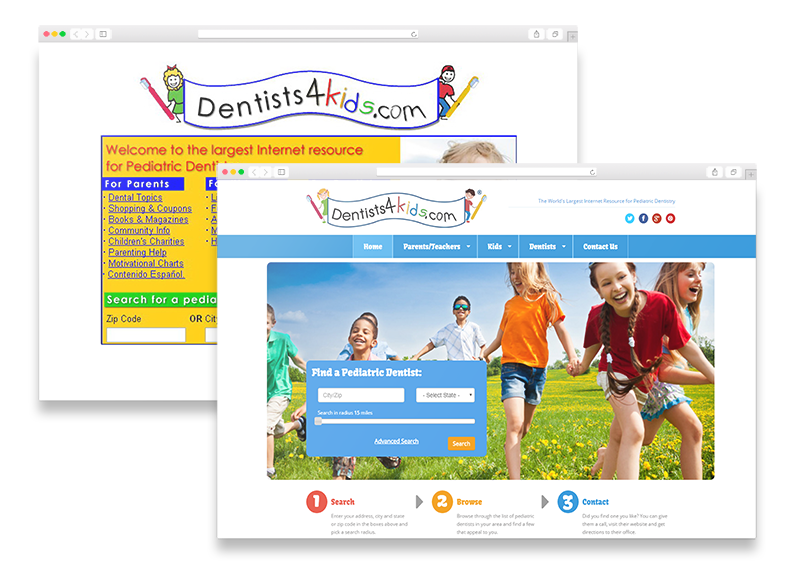 Visit our sister site, the world's largest internet directory of pediatric dentists. Copyright (C) 2018 MH Sub I, LLC.